An emotional masterpiece with words so powerful they pierce through the music and reach deep within our soul. Every touch of the guitar comes at just the right moment. It’s one of those rare songs when the singing is in perfect symbiosis with the music. The video lifts the melody to unfathomable heights. It is audio-visual poetry at its best. My recommended journey is to first listen to the song while reading the lyrics. Only then, armed with a hint of opinion and words of knowledge, should you delve into the depths of a work of art in body language. It’s not often that I post the full lyrics of a song, but in this case, it’s not only recommended, but outright necessary. I discussed the meaning of the lyrics and the video with several friends and was surprised to see how much it splits the crowd. Is it human to adore life? Is it human to ask for more? Me, yes, I must confess I adore life. You can purchase the album from the location below. 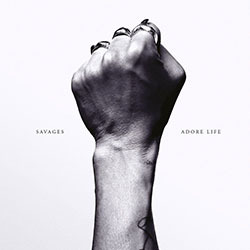 And in case you’re wondering, yes, I did purchase Savages’ album :).